A lawyer who provides comprehensive immigration service and legal help The Law Offices of KahBo Dye-Chiew in Honolulu strives for excellence in providing legal assistance with all aspects of immigration. Since 1991, Attorney KahBo Dye-Chiew has represented individuals, professional workers and families who want to work and live in the United States. She also helps small businesses and large corporations bring highly desired talent into the United States to fill their open positions. Attorney Dye-Chiew has always recognized that each case is different and she can draw on her more than 20 years of experience to provide the custom strategy that best serves her clients. Handling immigration issues with skill and authority At her law offices, Attorney Dye-Chiew puts her clients first. She offers the following distinctive advantages: Immigration law skill Immigration laws are complex and in flux, as newspapers and other media indicate, and new changes are not always in the best interests of small businesses and others. For more than two decades, Attorney Dye-Chiew has focused her practice almost exclusively on immigration law. She makes immigration law easily understandable to her clients so they know the process and likely outcomes. Accessibility Clients work with Attorney Dye-Chiew directly and are never handed off to an associate or paralegal. This direct relationship is the foundation of the firm's commitment to quality and comprehensive care, resulting in a better experience for clients. Responsiveness Attorney Dye-Chiew proves her devotion to her clients every day. Her goal is to respond to clients' calls, emails and questions within one business day so that clients will be fully informed about the process and their cases. The firm's goals are clear: To help you achieve your immigration goals To treat you with respect To provide you with the individual attention that your case deserves A full-service immigration law firm serving businesses, professionals and investors The Law Offices of KahBo Dye-Chiew provides comprehensive immigration legal help. The firm handles and resolves issues relating to the following areas of immigration law: Business immigration law Business immigration issues for small businesses are especially challenged by ever-changing laws. Attorney Dye-Chiew applies her immigration law skill and business law knowledge to protect her clients' interests at all times. Immigration for professionals The firm assists with immigration for professionals, including visas, in a variety of industries. Immigration law for investors The firm counsels on immigration law for investors, helping them obtain immigration benefits to oversee their investments in the United States. Immigration law for businesses Today's talent pool must be global to fill key positions in a highly competitive market. The Law Offices of KahBo Dye-Chiew advises on immigration law for corporations, helping them file the appropriate petitions that allow critical workers to be employed and live in the United States. Family based immigration law Attorney Dye-Chiew helps spouses and family members obtain immigration benefits to allow them to live together in the United States Visas Attorney Dye-Chiew takes the complexity out of the maze of visas to help professionals and other individuals work and reside in the United States. Citizenship To obtain citizenship in the United States, individuals must follow certain steps, which aren't always easy. The firm guides clients through the naturalization process so they can achieve their American Dream. Contact an experienced immigration attorney to achieve your immigration goals The Law Offices of KahBo Dye-Chiew in Honolulu, Hawaii helps individuals, businesses and families understand and follow the immigration laws that apply to their situations. Contact the firm today at 866-510-7082 or use the online contact form to schedule a consultation. Appointments are available Monday through Friday from 8 a.m. to 5 p.m. Validated parking is available, and public transportation can bring clients to the firm's convenient downtown location. An attorney assisting a wide range of clients with immigration issues The Honolulu Law Offices of KahBo Dye-Chiew takes pride in helping clients achieve their immigration goals. The firm's practice is as diverse as its clients. Clients typically include: Small U.S. businesses U.S. corporations Investors outside the United States Professionals seeking employment within the United States Families who want to sponsor a relative to come to the United States Religious organizations Immigration law is highly complex. 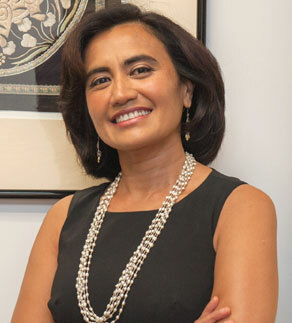 Attorney KahBo Dye-Chiew's skill and experience allow her to clearly explain the laws to clients. She keeps clients apprised of the status of their cases and is always available to answer questions. A law firm providing the full spectrum of immigration legal services The Law Offices of KahBo Dye-Chiew provides a full complement of immigration legal services based on Attorney Dye-Chiew's more than 22 years of experience. The firm routinely handles and resolves issues in the following areas of immigration law: Business immigration law Small businesses and larger U.S. corporations wishing to employ foreign workers can expect responsive, authoritative action from Attorney Dye-Chiew. Since 1991, Attorney Dye-Chiew has been helping businesses achieve their immigration goals. She keeps abreast of immigration laws for businesses to protect the interests of her small-business clients. Likewise, many U.S. corporations find they need to employ workers from outside the United States to fill agricultural, technical, scientific and other positions. The Law Offices of KahBo Dye-Chiew assists with immigration for U.S. companies, making certain that all forms and petitions to bring highly desired employees into the United States have the proper information and make the strongest case possible. Immigration for professionals Attorney Dye-Chiew aids professionals seeking employment in the United States by obtaining the proper employment-based visas. Immigration law for investors The firm offers immigration help for investors who wish to invest in the United States. Attorney Dye-Chiew advises them on how to structure their companies to obtain desired immigration benefits and assists them with entering the United States to oversee their investments. National Interest Waiver applications Attorney Dye-Chiew has assisted clients in obtaining permanent residency status in the United States by classifying them as persons whose entry into the United States is in the national interest of the United States. Family immigration For family immigration, both the sponsor and the family member who wishes to immigrate must follow various steps. For example, the sponsoring relative must file the I-130 Petition for Alien Relative. Visas Being able to obtain a visa depends on a variety of factors, including the country of origin, intention and profession. Attorney Dye-Chiew can skillfully guide clients through the alphabet soup of visas. Green cards The firm helps immigrants obtain or renew green cards that enable them to live and work in the United States, even when complex issues are involved. Citizenship Immigrants can achieve their dream of becoming a citizen of the United States through the process of naturalization. Although the steps along the way are not always easy to follow, the Law Offices of KahBo Dye-Chiew explains each step and its requirements and stands by you. Contact a skilled Honolulu immigration attorney who puts clients first The Law Offices of KahBo Dye-Chiew helps businesses, investors, professionals and families achieve their goals in the United States. Call 866-510-7082 or contact the firm online for assistance with immigration issues. Attorney KahBo Dye-Chiew meets with clients Monday through Friday from 8 a.m. to 5 p.m. at her downtown Honolulu office. For more than 22 years, KahBo Dye-Chiew has achieved excellence in the field of immigration law, especially relating to business. She has helped others realize their dream of living or working in the United States. She believes in hard work, dedication and commitment to her clients. She always has the best interests of her clients at heart. Attorney Dye-Chiew's education, professional memberships and community involvement reflect her dedication to immigration law. She has also earned the respect and admiration of her peers, evidenced by consistently being named one of Hawaii's best immigration lawyers. Her clients and peers agree that Attorney Dye-Chiew's intelligence and professionalism make her an outstanding immigration attorney. Recently named the Best Lawyers 2014 Honolulu, Immigration "Lawyer of the Year." (Copyright 2013 by Woodward/White, Inc., of Aiken, SC). Selected by her peers for inclusion in The Best Lawyers in America 2008, 2009, 2010, 2011, 2012 and 2013, 2014 editions in the field of Immigration Law (Copyright 2013 by Woodward/White, Inc., of Aiken, SC). Law Offices of KahBo Dye-Chiew has been named a Tier I firm in Honolulu, Hawaii for Immigration Practice by U.S. News Best Lawyers "Best Law Firms" in 2014. Contact the Law Offices of KahBo Dye-Chiew in Honolulu, Hawaii today to schedule a consultation with an attorney focused solely on immigration issues for more than 20 years. Call 866-510-7082 or contact the firm online. Appointments are available Monday through Friday from 8 a.m. to 5 p.m.